SIERRA was one of the sponsors of the 16th Corporate Real Estate and Facility Management Summit held on 19th and 20th March 2010 at Golkonda Resorts, Hyderabad. 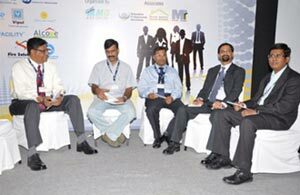 The CRE & FM Summit was organized by FMW (Facilities Management Worldwide), a part of MMG Worldwide. 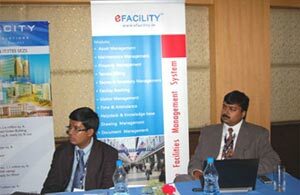 SIERRA's booth in the 16th CRE & FM Summit exhibited its flagship product – eFACiLiTY® Enterprise Facility Management Software. Our CEO & Managing Director, Mr.Giridhar JG was a part of the Panel that consisted of dignitaries from Wipro, WNS Global Services, CA (India) Technologies and Bridge House Consulting who discussed on "Facilities Management – Effective Vendor Management – Opportunities and Challenges – Partnership or Dictatorship!" The gathering was well represented by notable Corporates such as Cap Gemini, Cognizant Technology Solutions, Mahindra Satyam BPO, HSBC Technology and Services, Franklin Templeton International Services, etc. It was a 2 day Business Networking Summit designed for IT, ITES, BPO & Software Companies and Commercial & Industrial Organizations of all sectors who are intending and planning establishments of New Centers / Expansion/ Relocation of Facilities / Setting up of Global Delivery Centers and to cost effectively plan their onshore / offshore facility infrastructure to realize a better ROI (Return On Investment) to obtain in depth knowledge, explore novel ideas and integrate lucrative FM strategies. We feel elated that such events add on to our conspicuousness in the corporate world.